One of snowboarding’s pioneer competitors, 36-year-old Seth Wescott of Sugarloaf, Me., enjoyed a winning weekend during the FIS Snowboard World Cup Tour stop at Telluride, Colo. last weekend. 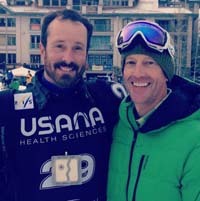 Wescott, who has been riding since 1989 when he was 13, along with his wax technician Curtis Bacca of Ketchum celebrated Wescott’s victory Friday in the second of seven snowboardcross World Cup events of the 2012-13 season. His third career World Cup victory came in a photo finish for two-time Olympic SBX gold medalist Wescott just inches ahead of reigning world champion Alex Pullin of Australia. The Waxroom owner and operator Bacca reported, “Seth is coming back from a season ending injury last season (torn breast muscle in Switzerland). “We spent September training in New Zealand and the last two weeks prior to Telluride training in Soelden, Austria, so this result was big news in the snowboard world. In the current FIS Snowboard World Cup men’s SBX standings, Wescott stands in fourth place with 1,020 points. He earned 1,000 points for Friday’s win. The current leader is Italy’s Omar Visintin with 1,320 points ahead of Pullin, 1,300. On Sunday, Wescott and six-time X Games snowboardcross champion Nate Holland, 34, of Truckee, Ca. won the team SBX title at the Paul Mitchell Progression Session in Telluride. Wescott, the first-ever Olympic champion in SBX at Torino, Italy in 2006, had to survive another close finish to win the team SBX title at Telluride. Wescott and Holland won each of the three heats. NBC Sports Network plans to televise the Team SBX of the Telluride Paul Mitchell Progression Session on Saturday, Dec. 22 from 12 noon to 1 p.m.